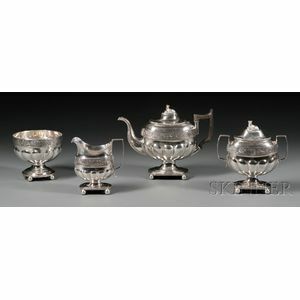 Late Federal Four-piece Coin Silver Tea Service, New York, c. 1830, John W. Forbes, maker, ovoid bodies with lobing to lower section, with die-rolled rim decorated with rose blossoms and scrolling vines, the lids with finials formed as recumbent leopards, angular handles, on stepped trumpet or ovoid bases with gadrooned rim and ball feet, comprising teapot, milk jug, covered sugar urn, and footed waste bowl, bright-cut monogram, teapot ht. 8 5/8 in., approx. 65.6 troy oz. sugar with small repair at join of bottom part of one handle to body. underside of tip of spout with restoration; wood section of handle possibly later. all with some minor age typical wear.